With the aid of TCD, I've decided to resurrect my WHDLoad Games launcher/loader/frontend "KGLoad". 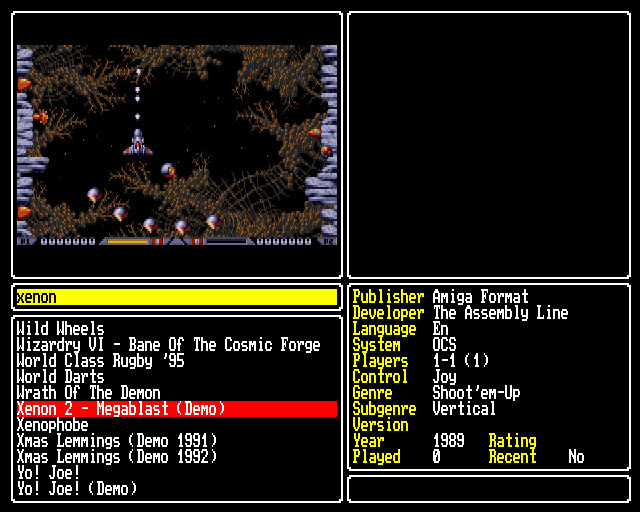 It loads WHDLoad games from a simple menu system, with screenshots and boxart displayed. There's been a lot of changes since the previous beta, and I'm really happy with how it's progressing. I would be grateful if people could give it a whirl and let me have your feedback. It should auto-detect PAL/NTSC and AGA/ECS and adjust accordingly. Edit the Profile.ini file stored in KGLoad/Profiles/Default and set your GameDir(s) to point to where your whdload games are stored. The game scanner recognises everything in my packs, it will support Retroplay's packs in the near future but there is more I want to get finished first. Just go to Options > Scan Games. The demos database is not included at the moment, again this'll come in a future version. There are some screenshots and ONE boxart in the zip at the moment, I've included these to aid testing, but they'll be fully updated later. I'll sort out some kind of full feature list later but for now, here's the controls. Last edited by killergorilla; 17 October 2012 at 12:24. Good news, thanks KG & TCD! TCD found an error in the original beta, so I've rebuilt and updated the link. W00h00!!! I was waiting for the ECS version for a long time! Btw KG, isn't the an option in the future to make an update pack based on Retroplay's packs? I've not spoken to Retroplay about it yet, but once we start adding support for the updated installs it's certainly something I'd like to do. - I have ClassicWB from Bloodwych that has the SYS:Games path (with 0_9-Z subfolders inside) which is assigned by default to A-Games: if putted in profile.ini doesn't scan the games. - If I copy a game to the Games folder inside KGLoad it scans it just fine. You'll just have to add GameDir=Path/A, GameDir=Path/B etc. etc. Added all 25 folders in seperate GameDir entries and they work ok. It's just plain slow to scan but that's ok for WinUAE for the initial scan. Last edited by mfilos; 01 October 2012 at 13:22. I'd left a bug in the 1.0b2 version which meant it'd render incorrectly in NTSC, this has been fixed and I've uploaded 1.0b3 above. KG mate are you using the default system font for KGLoad's displaying font? If I change the default system font to topaz 8 then it's looking exactly like your screenshots. Can't you just make the usage of topaz 8 build into sourcecode by default instead of using the default system font? Good call! Easy enough to fix. Will be updated in the next couple of days. Again, thanks for testing it. Beta 4 is now online (see the link in the first post). The default font is now set to topaz.font size 8. Font settings have now been added to the skin.ini file so you can choose your own fonts. Just a thought... Is it possible to use Rebel's 16 colors palette for ECS systems so we can see better coloring than the Red White combination?